Lock in a great price for Holiday Inn Express St. Albans - M25, Jct.22 – rated 9 by recent guests! Clean, warm, comfortable rooms. Good breakfast. Friendly staff. Breakfast. There was plenty on offer and all was beautiful cooked. Restaurant in the Evening a little slow needs more staff. Which I think would improve your takings. and menus on the table would be a help. The restaurant in the Evening is almost deserted. Due to staff and lack of staff. Great and easy to find location with secure parking. Friendly and professional staff. Compact and comfortable rooms. Great en suite facilities. Really liked the small sofa and table for working. Very friendly staff. Convenient location, comfortable accommodation. Value for money. Breakfast was great and the beds very comfortable, Room decor good and the shower really nice to use, Reception manned and very efficient. Welcoming, comfortable and satisfied. No complaints. Will be returning soon. Thank you all. Good location for Harry Potter tour. Easy and clean with a sufficient breakfast. New clean hotel. Easy access breakfast better than expected. Holiday Inn Express St. Albans - M25, Jct.22 This rating is a reflection of how the property compares to the industry standard when it comes to price, facilities and services available. It's based on a self-evaluation by the property. Use this rating to help choose your stay! 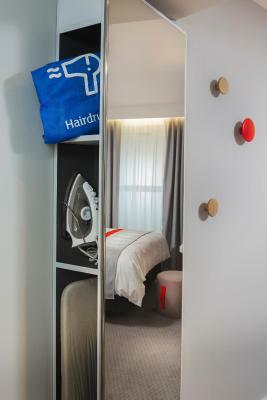 All bedrooms has an en suite shower with complimentary toiletries and a hair dryer. 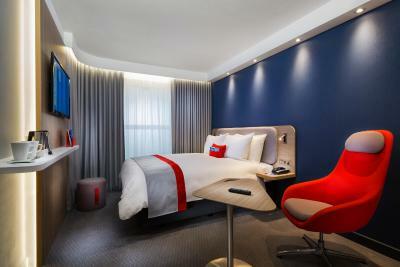 Rooms also feature a work desk, a flat-screen TV and air conditioning. The hotel offers a 24-hour front desk, with dry cleaning and laundry services and a meeting room with business facilitites. An airport shuttle can be arranged for a surcharge and a buffet-breakfast is available each morning in the on-site restaurant. 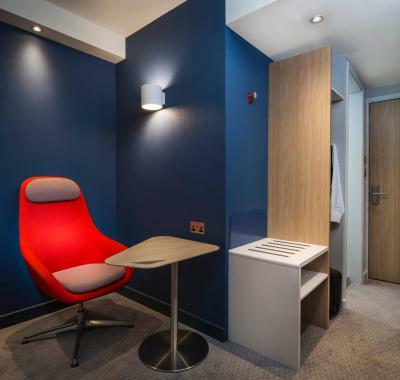 Holiday Inn Express St. Albans - M25, Jct.22 is within a 15-minute drive to St Albans, and guests are 16.5 miles from Luton Airport, and 25.7 miles from Central London. Frogmore Business Park can be reached within a 12-minute drive. This property is also rated for the best value in St. Albans! Guests are getting more for their money when compared to other properties in this city. When would you like to stay at Holiday Inn Express St. Albans - M25, Jct.22? This air-conditioned bedroom features a TV, work desk and en suite shower. The standard double or twin room has air-conditioning, a TV, work desk and en suite shower. Please note, the room configuration is available upon request. Please note that all Special Requests are subject to availability. Guests are advised to contact the property after booking to confirm their selection. 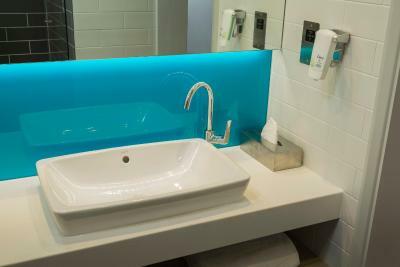 House Rules Holiday Inn Express St. Albans - M25, Jct.22 takes special requests – add in the next step! Holiday Inn Express St. Albans - M25, Jct.22 accepts these cards and reserves the right to temporarily hold an amount prior to arrival. Early check in may be possible upon request and prior arrangement with the property directly. Subject to Availability. Rooms are both comfortable and functional. Restaurant is bright and modern. We could not connect to their wifi. Could have included shampoo and conditioner in the shower. Very comfortable room. Breakfast was good with a lovely variety of food and the fruit looked very fresh. Toilet was not as clean this time. Comfortable bed. Generally very clean. Amazing pizza! Very nice and clean, decor lovely thought of everything needed for a very comfortable stay. Good choice of breakfast . We would have liked an onsite restaurant. The hotel impressed us with it's friendly, quality of room and cleanliness. The room rate was excellent value for money. Very clean, good shower, happy the breakfast was included - basic but enough, nice coffee. Rooms look very new and modern. All round good value for money. Very nice staff, happy to help and very clean rooms. The booking was made via booking.com, travelled for an hour to get to the hotel to arrive late at night and tired. The booking was not filtered through to the hotel and after finally proving to the hotel that we had made a booking (reception was not going to allow us to stay the night) we had to wait an hour in the lobby before being finally shown to a room with no door key of our own (staff let us in) and no booking was ever confirmed to the hotel from booking.com. I had to make a separate booking at front desk and pay again. Very very poor service even when I provided a booking reference.